After living in Germany for two years and going back at least once every year since 2003, I’ve had a great deal of travel along the most popular train routes with primary operator Deutsche Bahn to visit friends around the country. • the Zollverein Colliery in Essen. Bamberg is a beautiful place to visit with medieval architecture, red-roofed buildings, small narrow winding streets, grand churches on top of hills, the Little Venice next to the Regnitz river, and green foliage and colourful flowers decorating everything in sight. As the surrounding region is called Franken (Franconia), the seven hills on which the city was built has given Bamberg the nickname “Franconian Rome”. A significant part of the town was declared a UNESCO Heritage site in 1993. To complete your day in Bamberg’s Old Town, stop at Schlenkerla for their famous Rauchbier or “smoked beer”. • in under 2.5 hours from München via Nürnberg. Some friends have lived in Köln (Cologne) for most of their lives, and they’ve shown how warm and outgoing the city and its citizens can be. They’ve also not been shy in highlighting some of the existing urban tensions, which are no different compared to any other city or town in Germany. But one thing is clear: people here know how to drink and party hardy. The Kölner Dom (Cologne Cathedral) along with the Hohenzollernbrücke (Hohenzollern bridge) are without doubt some of the most recognized landmarks in the city, if not the country. Starting in 1248, the cathedral was built in various stages; so massive was the project that the cathedral was not completed until 1880, over six centuries for the taking. Ongoing restorations and renovations at the cathedral will keep caretakers busy for decades to come. The Cathedral became a UNESCO World Heritage Site in 1996. The place is rich with Roman history (Colonia, anyone? ), you can drink some fine Kölsch beer, learn about the history of “cologne” in Cologne, or cheer on the homeside at the Rhein-Energie Stadion and sing chants in the local Kölsch dialect in support of the football team 1. FC Köln. Then again, another highlight may well be the “love locks” on the Hohenzollern bridge. 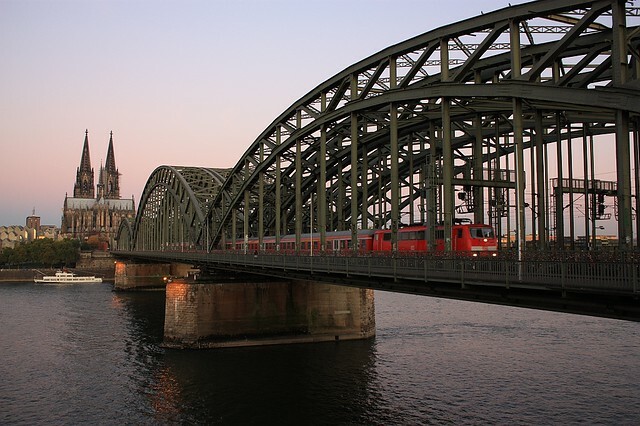 With Deutsche Bahn, you can reach Köln from Frankfurt am Main in about 60 to 90 minutes, depending on the number of stops on the InterCity Express train. 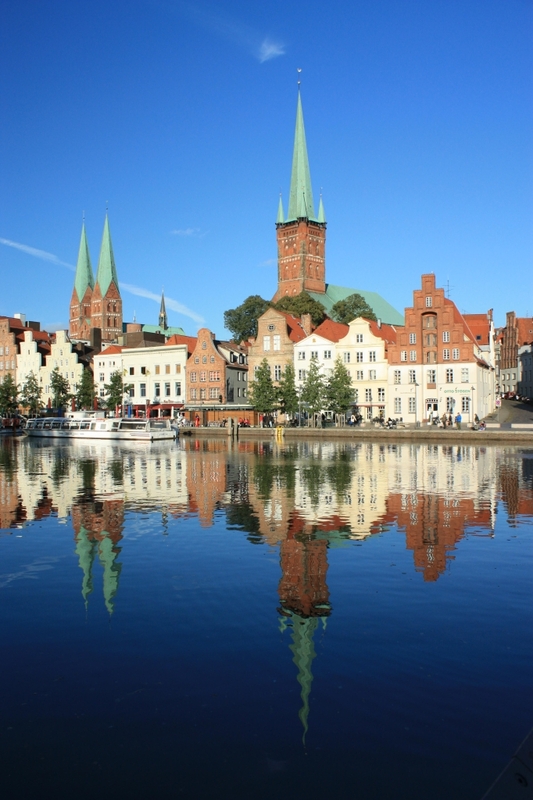 With a rich trading tradition dating back to the last-half of the 12th century, Lübeck was once the capital city of the Hanseatic League, a loose federation of trading and merchant cities. Lying close to the Baltic Sea, the city has great architecture in churches, city buildings, and the Holstentor (Holsten gate). Lübeck is famous for its marzipan; visit Café Niederegger for some samples and assorted cakes with tea. The city also boasts to being the home (“Buddenbrookhaus“) of the Nobel Prize-winning author Thomas Mann, the home of former German chancellor Willy Brandt, and the home of Nobel-Prize winning author Günter Grass. The historic centre of the city was declared a UNESCO World Heritage Site in 1987. My visit to Lübeck is highlighted here. • in about 2.5 to 3 hours from Berlin via Hamburg. Potsdam Park Sanssouci is a wide-open space with stepped grassy terraces, gardens, tree-lined paths, palaces, temples, and various ornamental buildings. 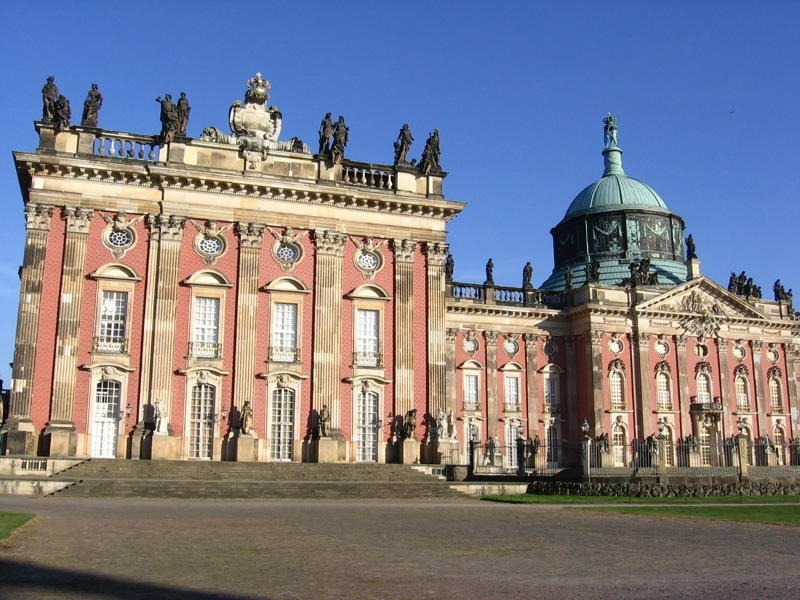 Sans Souci once served as the summer royal palace for Prussia’s King Frederick the Great. While some might be reminded of France’s Versailles by comparison, Sans Souci is smaller, and the stylings lean heavily towards the Rococo. The entire grounds span 290 hectares or over 30 million square feet. The various green spaces in Potsdam and Berlin were declared a UNESCO World Heritage Site in 1990. From Berlin’s main train station, Potsdam can be easily reached in under one hour with S-Bahn or regional trains. What do you do with old coal-mining facilities when there’s no more coal to process? Over decades, various industrial sites have come and gone, and some lay in ruins. The Ruhr region could have remained a wasteland until bold imaginative initiatives were pushed forward to revitalize the area. Along with Pécs (Hungary) and Istanbul (Turkey), the city of Essen in Germany was designated as one of three UNESCO European Capital Cities of Culture for 2010. Various projects, sites, and monuments throughout the Ruhr region were on display for most of the year. One of the big highlights in Essen was the Zollverein Coal Mine Industrial Complex which has been listed as a UNESCO Heritage Site since 2001. The entire refurbished Zollverein complex now houses space for art, design, and cultural exhibitions, and is also home to the Ruhr Museum, which provides detailed historical accounts of the economic importance of coal mining and its consequent decline, as well as descriptions of existing and future economic redevelopment plans for the Ruhr region. 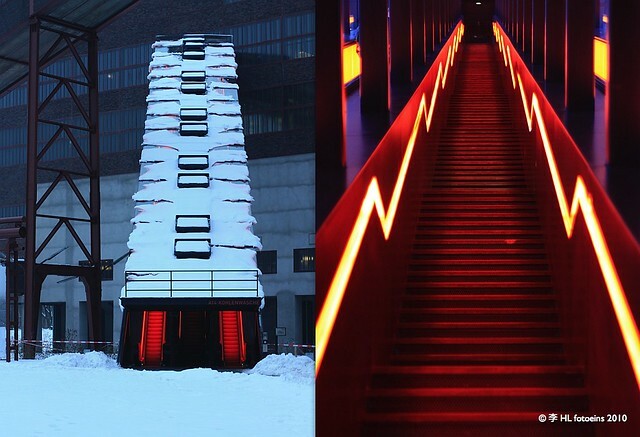 My visit to the Zollverein is highlighted here. With Deutsche Bahn, you can reach the city of Essen in about an hour from Köln. 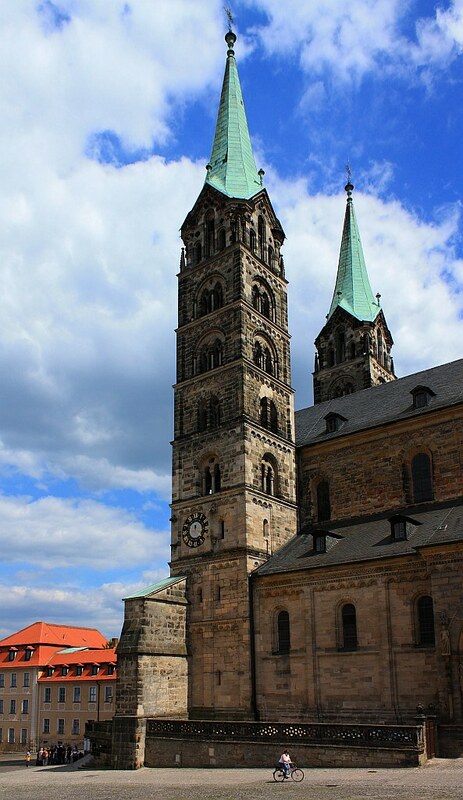 Do you have a favourite UNESCO World Heritage Site in Germany? Are there other specific World Heritage Sites you want to visit? I made all of the photos above between 2005 and 2010; this post is published on Fotoeins Fotopress at fotoeins.com as http://wp.me/p1BIdT-nP. Hi, Christina. I’ve visited Bamberg twice, and both have been memorable visits. I’m familiar with everything to which you’ve referred, although I didn’t spend as much time on Austrasse as I did (with the beer) on Sandstrasse. 🙂 You’re right about the Rosengarten; when I last visited in June 2010, the garden was beautiful with all of the flowers on full display. Thank you for your comments and for emphasizing how great Bamberg is! Great List! I was in Bamberg last summer and loved it. The rose garden is wonderful as is all the beer 🙂 I just got back from a visit that included Potsdam. Wonderful and beautiful city. Although I’ve never been to Lubeck it reminded me of Rostock. I really like that brick architecture! Hi, Deb. I’m glad you thought similarly about Bamberg as I do, especially the beer. 🙂 It’s interesting, isn’t it, to see how much influence the Hanseatic League has had on the architecture of cities like Potsdam, Hamburg, Lübeck, Rostock, etc. : classic brick architecture, steep triangular roofs. Thanks for reading and for your comment! Great Post! I long to get back to Europe- there are just too many places I want to revisit, and many more I haven’t been to that I’m dying to go to! Thanks, Erik! Initially, I had visited these places without knowing they were in fact World Heritage Sites (WHS). Of course, one realizes why after the fact! With a list of UNESCO WHS, I’m going to seek out a few more this fall. Hi Henry, interesting post. Germany is one European country I haven’t explored much. I’d like to visit all those sites someday, particularly Lumbeck which looks very spectacular. Like your photos! Hi, Marisol, and thanks for your kind comments. Not only am I a Europhile, I’m a big Germanophile! 🙂 So it was time I wrote about a few UNESCO sites in Germany; the country, however, offers much more. I hope you can visit Germany and spend some time there. Thanks again for reading! Henry, I loved reading your list but it also makes me a little ashamed that I haven’t managed to tear myself away from Berlin in the time (almost a year now) that I’ve been here. I’m determined to see more of Germany but Berlin is not making it easy for me to go elsewhere! Thanks! I hope you’ll be able to make your way around the country some more. As you know, it’s relatively easy to do, and I hope to convince you and others that there are lots of things worth seeing in and around the `Schland. Then again, Berlin is so very rich in sights and activities that it’s hard to leave; I know I’ll likely face something similar, too. Thanks again for reading and commenting! Such a great post! My favorite UNESCO WHS is definitely Regensburg!! Though, I may be a bit bias, I just spent the past 4 years there! Regensburg has been a place I’ve wanted to visit for some time. I’m sorry I caught your reply so late, but I very much appreciate you stopping by my blog and commenting on my blog post.